Here in stationery world, summer is our slow(er) season. Think about it, you're ordering invitations 6-8 months before your wedding, so while everybody is enjoying their beautiful summer weddings, I get to sit back and relax a little. Except that I don't sit back and relax much, instead I tend to spend summers catching up on blogging, and behind-the-scenes business stuff. It also means that, come summer, I have an entire season worth of new work to show off, erm, I mean share. Today I want to share the Clair suite, which I created with my bride, Clair (I get two points for creatively naming the design, no?). Clair had a destination wedding in Mexico, which is my husband and my favorite place - we haven't been to Cabo yet, but it's on our bucket list. Back to the topic at hand: Clair. Clair was inspired by the Élan calligraphy design, but since we didn't have time for calligraphy, I chose a font that maintained a similar aesthetic. The suite is silk screen printed in gold and grey on bright white, double thick, smooth as silk paper. The invitation was paired with the sweetest matte, blush pink envelopes and the results were like a sweet Mexican dream. Siiiiggghhh. 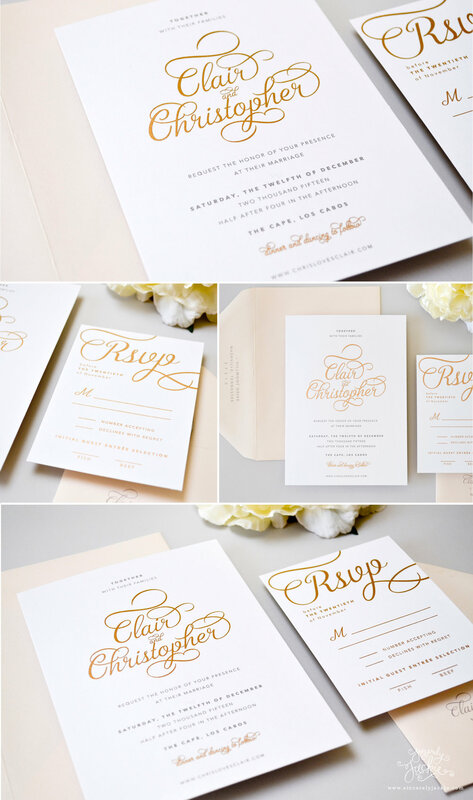 Join me next week as I share more wedding invitations from this past season!